Turn your PC into the coolest television in the house. Pause the TV show while you get a snack. Rewind and watch that great play again. Fast forward past the advertisements. 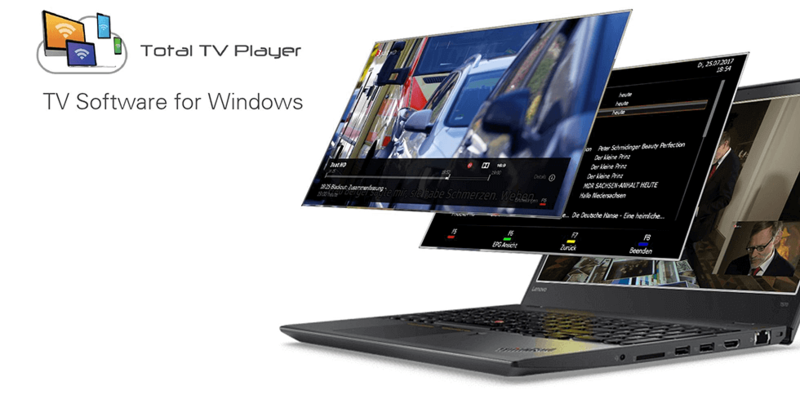 Float the Total TV Player window on top of other applications to keep an eye on your show while you work or surf the Web, and watch two TV windows Picture-in-Picture. The Total TV Player puts detailed and up-to-date TV listings at your fingertips. The Player’s integrated Program Guide harvests the TV listings data contained in over-the-air digital broadcasts as well as online sources. Is the show you started watching 10 minutes ago worth saving? No problem. The Total TV Player can record back to the beginning of the program from the live TV buffer and won’t mind a bit if you pause, rewind, and fast-forward while you watch the rest of the show. Use the Total TV Player’s built-in Editor to remove unwanted content from your recording, or to crop the beginning and end of the show. Please note that recordings from h.265 encoded channels cannot be edited. The Total TV Player records and plays Dolby® Digital sound, including 5.1 multichannel audio, where available. The Total TV Player also passes through Dolby® Digital 5.1 sound to home theater systems.